How Do You Wash Long Full Lace Wigs? "How do you wash for long full lace wigs?" Washing long full lace wigs (or any other king of long hair wig) is a bit different to the ordinary washing methods for wigs as it's about preventing tangling and using a single method of washing irrespective of the hair texture or indeed the type of wig. Oh and when we say long we mean any texture beyond 20 inches. As there are quite a few queries about this, we've put together response to some of the questions, so if you are planning on wearing long lace wig (or have one already), here are a few tips to follow to keep those long locks looking luscious for longer (that's a tongue twister - say it five times quickly if you don't believe it!). The usual recommendations are that straight and lightly wavy wigs can be washed using the basin method and that very wavy and curly textured lace wigs should be washed using the upright method; well here's where we make a bit of a departure. All long full lace wigs (or any other kind of long hair wigs) - irrespective of hair texture - should always be washed using the upright washing method. The reason for this is simple: if you want to prevent tangling then all of the hair has to be facing the same direction for the entire time it's being washed. If you swish a long hair wig around in a basin or sink, then it's bound to end up tangled, even if it's silky straight in texture. This is especially problematic if you have a synthetic lace front wig as if the hair becomes very tangled (and it shouldn’t if it’s cared for properly) it can prove difficult to fully detangle it without distorting the texture (over stretching the synthetic (plastic) fibre)…wow, that was quite a few parentheses. If you don't have a polystyrene head (Styrofoam) or you don't have a shower, you can always use another method for washing your long hair wig. Section the long hair wig into four parts (two at the front and two at the back) and make four large loose braids. Pour this mixture over each of the four large loose braided sections of your lace wig. You can do all of them at the same time or just one at a time. 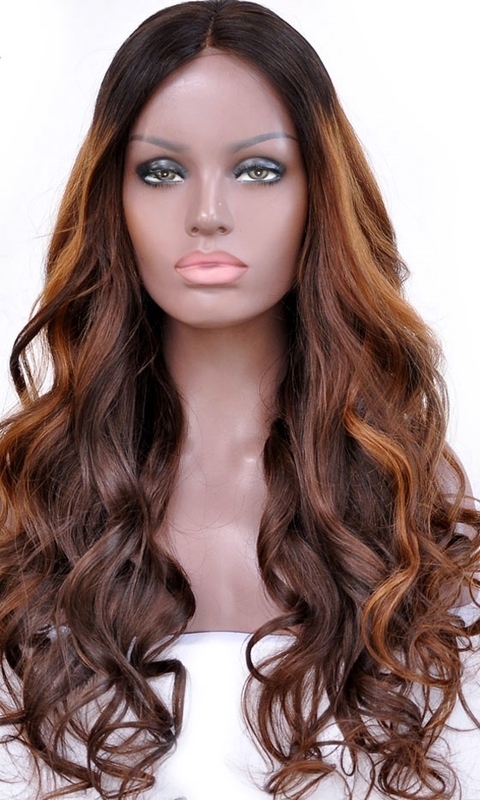 Dry curly and wavy lace wigs in an upright position Curl and wave patterns become distorted when the hair is dried flat. Always hang or stand deep wave and curly hair wigs to air dry in an upright position; this is essential for retaining the uniform wave and curl pattern. Okeydokey, we've woven our way through the washing methods for long full lace wigs (and other types of long hair wigs). If you’d like more information there's an article about how long hair lengths affect affordability or to review the answers to other questions, you can check out the Lace Wig Q&A section.